Consecutive Sudoku is one of my favorite Sudoku type. In this Sudoku if any adjacent cells are having two numbers which are consecutive to each other than it is represented with a dot or line between the cells. This Sudoku type follows converse rules. It means that all the possible consecutive numbers are marked in the Sudoku grid. This rules makes very difficult for a Sudoku creator to make a good design for the Sudoku. 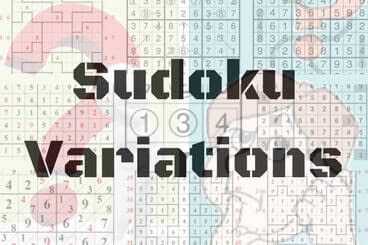 To create the good aesthetics for Sudoku, new Sudoku type called Consecutive Pairs gets invented. Most of the rules of Consecutive Sudoku Pairs are similar to Consecutive Sudoku Puzzle with one difference that converse rule does not apply to Consecutive Sudoku Pairs types. It mean as a puzzle creator, one does not need to give all the possible Consecutive combinations and one can come up with very good designs in this Sudoku type. Classic Sudoku Rules apply. Additionally, if a circle is given between two adjacent cells, then the two numbers in those cells must be consecutive. do note that not all circles are given. It means that adjacent cells without a circle may contain either consecutive numbers or nonconsecutive numbers. 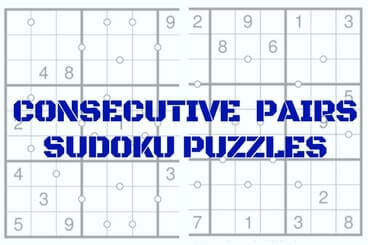 Below are some of the Sudoku puzzles for Consecutive Sudoku Pairs type which I created for Fun With Puzzles website.